When you arrive at Le Bonheur Guest Accommodation McGregor, you will discover that we are situated within walking distance of the various shops, restaurants, coffee shops and arts and craft venues. 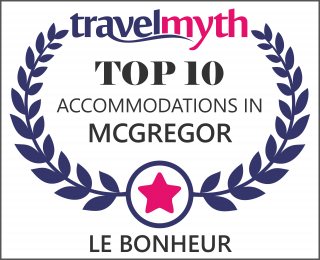 It is the norm that parking outside accommodation establishments is on the street and Le Bonheur Guest Accommodation McGregor is no exception. Le Bonheur Accommodation McGregor has 2 guest suites available for couples looking for a romantic night away from the TV and the kitchen sink! Both suites have private entrances along pretty garden paths and private outside patios where you can enjoy your morning coffee or a glass of wine at sunset. Luxurious queen-size brass beds await you in suites that are well-insulated against the summer-heat; but will also keep you warm during the bitterly-cold winter nights! You will be able to enjoy a candle-lit bath or shower in the en-suite bathrooms which are appointed with modern fittings and fluffy towels on heated towel rails. 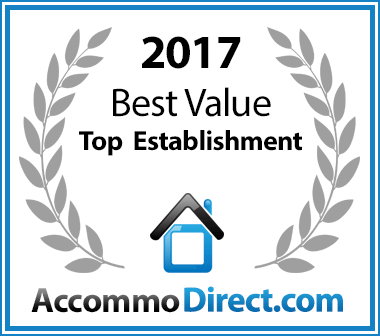 There are separate bath and shower facilities in both Suites.